Federico Fellini (January 20, 1920 - October 31, 1993) was one of the most influential and widely revered Italian film-makers of the 20th century and is considered to be one of the finest film directors of all time. A unique combination of memory, dreams, fantasy, and desire, Fellini’s films are deeply personal visions of society, often portraying people at their most bizarre. The term “felliniesque” is used to describe any scene in which a hallucinatory image invades an otherwise ordinary situation. His father Urbano (1894-1956) was a traveling salesman and wholesale vendor. In August 1918 he married Ida Barbiani (1896-1984) in a civil ceremony (with the religious celebration the following January). After Federico’s birth in 1920, two more children arrived: Riccardo (1921-1991) and Maria Maddalena (m. Fabbri; 1929-2002). Urbano Fellini was originally from Gambettola, where the young Federico vacationed at his grandparents’ house for several years. Born and raised in Rimini, his childhood experiences would later play an important part in many of his films, in particular, I Vitelloni (1953), 8½ (1963) and Amarcord (1973). It is misleading, however, to assume that all of Fellini is purely autobiographical anecdotes and fantasies. Intimate friends such as screenwriters Tullio Pinelli and Bernardino Zapponi, cinematographer Giuseppe Rotunno and set designer Dante Ferretti have insisted on how Fellini invented his own memories simply for the pleasure of narrating them in his films. Variety Lights (1950), Fellini’s first film, was co-directed with the more experienced director, Alberto Lattuada. The film is a charming backstage comedy set amongst the world of small-time traveling performers, a world Fellini knew well after working on Roberto Rossellini’s Paisà in 1946. While the film shoot was an exhilarating one for the 30-year-old Fellini, its release to poor reviews and limited distribution proved a disaster for all concerned. The production company went bankrupt, leaving both Fellini and Lattuada with debts to pay for over a decade. Fellini’s first solo-directed film was The White Sheik(1952). Starring Alberto Sordi, the film is a revised version of a treatment first written by Michelangelo Antonioni in 1949 and based on the fotoromanzi, the very popular photographed cartoon strip romance magazines published in Italy at the time. Producer Carlo Ponti had commissioned Fellini and Tullio Pinelli to develop the treatment. Finding the finished screenplay perplexing, Antonioni gave it to Alberto Lattuada who also turned it down. 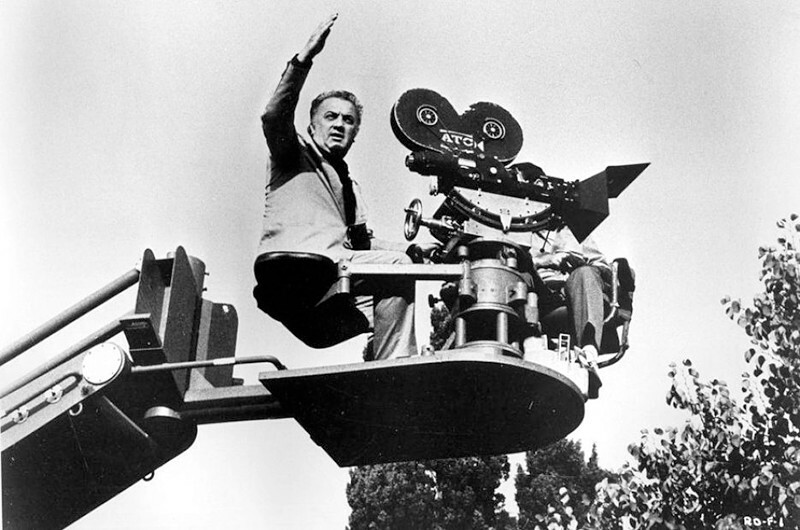 Fellini then decided to take the plunge and direct the film himself. In addition to making films, Fellini also wrote scripts for radio shows and movies (most notably for Roberto Rossellini, Pietro Germi, Eduardo De Filippo and Mario Monicelli) as well as numerous and often uncredited gags for well known comic actors like Aldo Fabrizi. A gifted caricaturist, Fellini produced satirical drawings in pencil, watercolors and colored felt pens that toured Europe and North America, and which are now eagerly sought after by collectors. Much of the inspiration for his sketches was derived from his own dreams while the films-in-progress stimulated drawings for decor, costumes and set designs (just as it was for Eisenstein whose own drawings share striking affinities with Fellini’s work). In 1942, Fellini met Giulietta Masina, and a year later, on October 30, 1943, they were married. Thus began one of the great creative partnerships in world cinema. Several months after their marriage, Masina fell down the stairs and suffered a miscarriage. Then, on March 22, 1945, Pierfederico (nicknamed Federichino) was born but died a mere month later on April 24. The tragedy affected the couple in profound and at times unconscious ways, particularly in the conception of La Strada (1954). The Fascist regime fell on July 25, 1943 and the Allies liberated Rome on June 4, 1944. During that euphoric summer, Fellini set up the Funny-Face Shop with his friend De Seta, drawing caricatures of Allied soldiers for money. It was here that Roberto Rossellini came to see Fellini about his project, titled Rome, Open City (1945). Rossellini wanted the young man to introduce him to Aldo Fabrizi and collaborate on the script (with Suso Cecchi D’Amato, Piero Tellini, and Alberto Lattuada). Fellini accepted, contributing gags and dialogue. In 1948 Fellini acted in Rossellini’s Il Miracolo with Anna Magnani. To play the silent role of a rogue who is mistaken by Magnani for a saint, Fellini had to bleach his black hair blond. A major discovery for Fellini after his great neorealist period (1950-1959) was the work of Carl Jung, whom he first read in 1961 under the supervision of noted Jungian psychoanalyst, Ernst Bernhard. Jung’s seminal ideas on the anima and the animus, the role of archetypes and the collective unconscious were vigorously explored in such classics as 8½ (1963), Juliet of the Spirits (1965), Satyricon (1969), Casanova (1976), and City of Women (1980). Other actors with whom Fellini worked include Marcello Mastroianni, Anita Ekberg, Anthony Quinn, Donald Sutherland, Terence Stamp, Magali Noël, Roberto Benigni, Anna Magnani, Janet Suzman and Pina Bausch. The great Italian poet, Andrea Zanzotto, wrote verses for Fellini’s Casanova (1976) and opera lyrics for And the Ship Sails On (1983). Throughout the 1950s, 1960s, 1970s and 1980s, his films were widely acclaimed, and four of his movies won the Best Foreign Film Oscar. In 1990, Fellini won the prestigious Praemium Imperiale awarded by the Japan Art Association. Considered as the equivalent of the Nobel Prize, the award covers five disciplines: Painting, Sculpture, Architecture, Music, and Theatre/Film. Past winners include Akira Kurosawa, David Hockney, Pina Bausch, and Maurice Béjart. In 1991 Fellini’s graphic novel “Trip to Tulum” was translated into English by Stefano Gaudiano and published in the magazine Crisis with artwork by Milo Manara. Elizabeth Bell supplied additional English translation for the Catalan Communications edition, selected by Publishers Weekly as one of the best trade paperbacks of 1990. In 1992, Canadian director Damian Pettigrew filmed a long final interview with Fellini for the cinematic portrait Fellini: I’m a Born Liar (2002) that has been described as the maestro’s “spiritual testament” by Fellini biographer Tullio Kezich. In 1993 Fellini received an Oscar “in recognition of his cinematic accomplishments that have thrilled and entertained audiences worldwide.” That same year, he died of a heart attack in Rome at the age of 73, a day after his fiftieth wedding anniversary. His wife, Giulietta Masina, died six months later of lung cancer on March 23 1994. Federico Fellini, Giulietta Masina and their son Pierfederico are buried in the same bronze tomb sculpted by Arnaldo Pomodoro. Shaped like a ship’s prow in the water, the tomb is located at the main entrance to the Cemetery of Rimini. The Federico Fellini International Airport in Rimini is named in his honor.